Our second season of common carp management on the Lake Owasso chain of lakes is well underway. 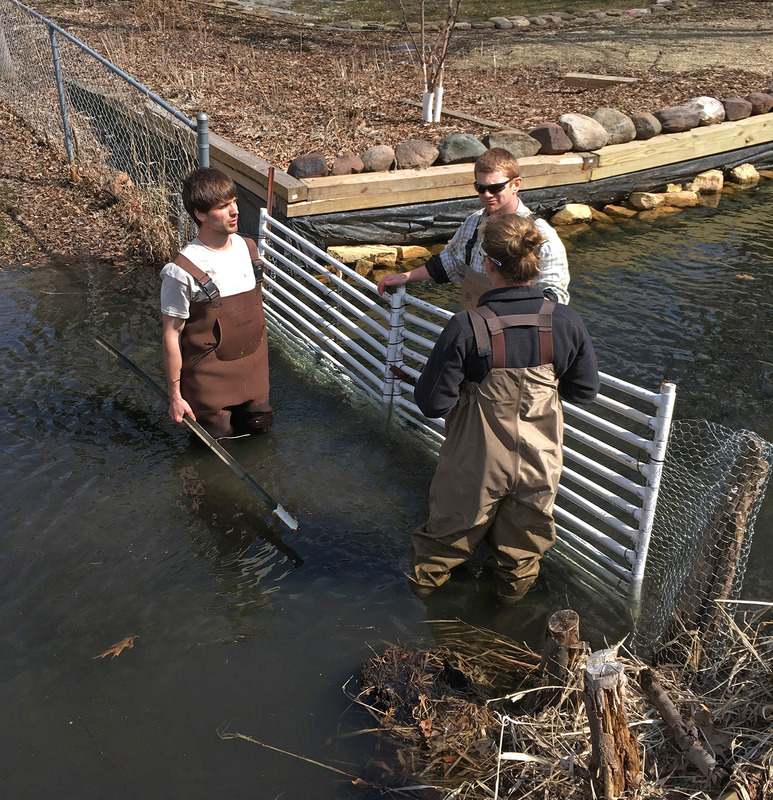 Box-netting has successfully removed large numbers of adult carp, and strategically-placed barriers are preventing carp from reaching shallow spawning grounds this spring. This is part of an ongoing project to keep the Owasso carp population under control to benefit water quality as we have done on the Lake Phalen Chain since 2009. As a first step in assessing the carp population in the chain, we commissioned an electrofishing survey on lakes Owasso, Bennett, Wabasso, Emily, Grass and West Vadnais. The purpose of those surveys was to determine if carp biomass was exceeding 90 pounds per acre, which is typically used as a management threshold. Carp biomass over this level is often correlated with poor water quality, since carp stir up phosphorus and sediment as they root for food in the lake bottom. Because catch rates were high, a mark-recapture study was conducted in Owasso to obtain a more accurate estimate of carp abundance. Over 200 carp were marked by clipping fins and releasing fish back into the lake. In late summer, we tested out a box net baited with dried corn to see if it would be an efficient method to remove carp in Lake Owasso. Once a large number of carp were feeding on top of the net, the sides were pulled up, effectively trapping the carp, which were then removed from the net and transported back to shore in a boat. 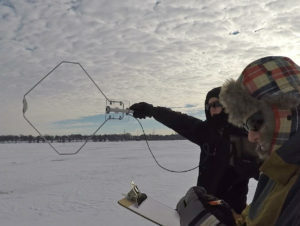 Carp Solutions staff used radio telemetry to track and record carp locations through the ice. Last summer, 20 radio-tagged carp were released into Owasso. Carp tend to school tightly in the winter months, and these tagged fish often give away the location of large schools. From August through February, biologists from Carp Solutions were out tracking the radio-tagged fish to record their movements and potentially set the stage for commercial netting. We learned that large schools of carp make their way into Lake Owasso’s northwest bay during the winter, not far from where the summer box-netting took place. With this information in hand, we contracted with a local commercial fisherman to harvest carp out of Owasso. Commercial carp fishing is often a “boom or bust” type of activity. Sometimes they hit pay dirt with massive hauls, and other times they strike out and don’t catch a fish. Through the tracking, we learned that carp in Owasso seem to move around quite a bit and don’t stay congregated for long. As one could imagine, this made it very difficult to effectively time the commercial netting efforts. However, on February 15, we had more than half of the tagged carp schooled in the northwest bay. The fisherman was available and decided it was time to net. He had a crew of eight, along with two tractors, trailers and plows on the ice. It took about four hours to prepare the site for netting as the crew drilled large holes and placed a long purse seine down into the lake. As the fishermen proceeded to pull, the net snagged a couple of large, heavy objects on the lake bottom. Unfortunately, the seining operation had to be aborted, and the net was pulled out with no fish. The fishermen later talked to a homeowner on the lake who thought the net likely snagged on a couple of cement mooring anchors. Unforeseen objects on the lake bottom seem to be the biggest risk to these winter netting operations. We made substantial progress last year and will certainly build on this base of knowledge. Our three main objectives this year are to: 1) Continue to remove adult carp from Lake Owasso; 2) Determine where key spawning locations are in the chain; and 3) Evaluate barriers to determine if they are effective in limiting carp movements during the spawning period. Shortly after ice out in May, we installed temporary PVC and wire mesh barriers at five key locations on the Owasso Chain. The barriers prevent carp from migrating through shallow channels into marshy ponds and wetlands where they prefer to spawn. Carp spawning success is much more limited in main lakes where their eggs and young become easy food for native fish like bluegills and largemouth bass. District staff check the barriers daily, often finding schools of carp nosed up against the barriers. Using handheld nets and electroshocking equipment, we’ve removed several hundred carp from these locations – not enough to impact the population outright, but significant when you consider that many of these carp were en route to prime spawning grounds. This barrier in the outlet channel of Lake Wabasso prevents carp from migrating to and from Grass Lake, a shallow wetland with few natural predators that serves as a carp spawning and nursery area. In addition to the carp barriers, we plan to expand summer baited box netting with the staff from Carp Solutions, possibly placing a few nets in strategic locations (last year, we had only one net in operation). With multiple nets, it may be possible to remove about 25 percent of the carp population in Lake Owasso. The Natural Resources team looks forward to managing carp in this important water resource, working to improve water quality and also clear some space for the native fish community in the process. Questions or comments? Join the conversation on our Facebook page, or drop us an email.